Honesty, it has been said, is the real test of a person's character. But how is this important human trait acquired? I DIDN'T realize until I got home that the bank teller who cashed my check had given me $150 too much. The next day I returned to the bank and went to the same teller. I explained what had happened and handed her the money. She stared at me incredulously and then, in a bewildered but thankful voice, said, "Most people would have just kept it." One day at the grocery store I had to write a check for a few small items. I should have known better. "Do you have a check-cashing card for this store?" the clerk asked. I fumbled for my wallet and found the card. "May I see your driver's license, please?" I produced it. I noticed that a lot of people were waiting behind me in line. As the clerk handed me my receipt, I asked her, "Wouldn't it be nice if everybody just trusted each other?" As she began to ring up the next customer's groceries, she answered matter-of-factly, almost absentmindedly, "It will never happen." "No legacy," wrote Shakespeare, "is so rich as honesty." If honesty is richness, the society in which you and I live is very nearly bankrupt! Why can't the superpowers agree on treaties that would prevent a nuclear World War III? Because they don't — can't — and perhaps don't intend to — trust each other to stand by the words written in agreements. Why do interpersonal problems plague families — husbands and wives, parents and children, brothers and sisters? Because in many cases family members have been hurt by each other's lies, lack of openness, untrustworthiness and hypocritical actions. People in general lack faith in the promises of governments, politicians, advertising, the media — even religions. Because of unkept promises of the past, ridiculous exaggerations, scandals over dishonesty and the perception that everyone is just out to get something. Whatever happened to honesty? Authorities agree that honesty is a learned value — we're not just born honest or dishonest. Somewhere along the line, a large number of people have failed to learn honesty — failed to develop it as a character trait. On the other hand, some have learned it. So how is honesty learned? Where and when do we get our concepts of what is honest and what is dishonest? How should we learn to be open, reliable, sincere, disposed always to tell the truth?. Or should we always tell the truth? Is there ever a time when lying, deceiving, exaggerating or withholding information• is best? Trust, sincerity, candor and reliability seem rare today. As one writer said, "To be honest, as this world goes, is to be one man picked out of ten thousand." Author Adrienne Popper related that her parents had given her her concept of honesty when she was a child. She remembered in particular the story of Abraham Lincoln, who, when working as a store clerk, had walked a few miles to return a penny he had overcharged someone. "When I was a child, one of my favorite bedtime stories described 'Honest Abe', "she commented. "I understood the importance of being honest, for I could sense the approval in my father's voice as he read me this and other moral tales. "When I read the fondly remembered tale of young Abe to my son not long ago, his reaction differed widely from mine. "'Miles to return a penny!' he exclaimed. 'What a dope! He should have kept it. He could have lied and said he found it.'" Children in general today do not grow up hearing about "Honest Abe" Lincoln, but about government scandals and other unrighted injustices. They are attracted to Dallas' J.R. Ewing, one of television's prime examples of corrupted power. Dishonesty, injustice and corruption, of course, extend beyond the personal level into national leadership and government. A recent survey showed that Americans do not think it possible to have a government almost wholly free of corruption. And why shouldn't they think that way, what with revelations of dishonesty and wrongdoing in government and business? I have a close personal friend, an editor of the Spanish edition of The Plain Truth, who came to the United States from a major South American country where he formerly owned a business. I say "formerly" because high taxation in the country forced him to give up the business. The government, says my friend, knows that most citizens will cheat on their taxes, so the government raises taxes to unbearable levels to gain the minimum revenue required. My friend simply could not pay what the government said he owed and stay in business. And he chose not to be dishonest. My friend's brother, still a resident of the country, received a certain inheritance from his father. He faithfully reported the inheritance to the government, which promptly claimed more than half of it in taxes. What was even more shocking, though, was the reaction of his friends and neighbors. Most of them ridiculed him and some even became angry with him because he had been so "stupid" as to tell the government the truth. This was certainly not the spirit of Simon Bolivar, called the "Liberator of South America." Bolivar refused to use government money to provide benefits for himself and avoided using his power to gain personal influence or advantage. He wrote: "There is no human power that can oblige me to accept a gift that my conscience refuses." What can the individual do to cope in a mostly dishonest world, when even government, theoretically the protector of personal rights, does not expect to be trusted? How is honesty to be learned in such societies? Psychologists say that no one can be labeled totally honest or totally dishonest. Rather, honesty is a continuum upon which all of us fall, some closer to the honest end and some closer to the dishonest end. I have another friend who, on a visit to one of the Arab countries, had a taxi driver carry him some little distance. When he gave the driver a gratuity above the price of the ride, the driver refused the tip. My friend insisted, grateful for the service the driver had offered. Only reluctantly did the driver accept the tip, and then he lowered the price of the ride the exact amount of the tip! Can you imagine this scene occurring in London or Paris or New York? China Daily recently reported that nearly 10,000 people were thronging a Chinese department store in the northeastern city of Changchun when the lights went out. Nothing was stolen! People holding goods when the blackout occurred handed them back to staff members. Others lit candles or volunteered to help keep order. Bank notes totaling the equivalent of US$80,000 were lying out in a bank branch in the store, but not one was stolen. Store employees commented, "The store was blacked out, but the customers were a shining example of honesty." Turn out the lights in New York City for a few hours and notice the different result you will achieve! Some learn honesty, while others don't. Why? The whole problem of how the human conscience develops — of how different individuals or groups acquire orientations toward one moral action or another — has been much debated by psychologists, sociologists, even theologians. The process begins in earliest childhood. Research has produced some interesting implications for parents and teachers. As they grow older, children will basically retain the sense of moral judgment they acquired early, unless major experiences later alter their viewpoints. 1) At the first level, the very young child has little or no control over his or her own actions. If the child is about to put a hand into a flame, the parent must intervene. If the child reaches for an object on a store shelf, the parent must intervene. The child cannot judge any better. 2) At the second level, the 2-year-old child begins to identify, at least hazily, a difference between actions to be considered wrong and actions to be considered right through a system of rewards and punishments. The child learns that if he spills his glass of milk, he will be reprimanded, whereas if he obeys a parent's command to "Come here!" he will receive approval. The child begins to learn to make choices. 3) At the third level, the maturing child begins to adopt someone else's values. He (or she) identifies with another person, be it a parent, playmate or television image. He now develops an internal orientation toward moral judgments. He does what he sees his role models do. It is at this stage that parents are often shocked to find that their child has picked up some of their own bad habits! "He's just imitating you!" one parent will tell another. 4) At the fourth level, the maturing boy or girl makes his or her own decisions. The young person becomes more or less independent in his judgments, especially of Mom and Dad. He comes, for example, to believe that his parents are wrong when they drink to excess or smoke, and he decides that he will not do so. Or he may decide under peer pressure to smoke experimentally even if his parents don't. He vow charts his own direction in life, building on the foundation of previous teaching, conditioning and of personal observations. The goal, then, of a concerned parent is to help the child develop, beginning with the earliest years, a right internal moral orientation based on principles and values that will hold him in the best stead throughout life. Even the Bible echoes this sentiment in the proverb that urges, "Train up a child in the way he should go, and even when he is old, he will not depart from it" (Prov. 22:6, Jewish Publication Society translation). The child, in short, must develop an educated conscience. As author Adrienne Popper states, the young child internalizes the parent's cautionary voice. Typically, a parent will overhear a youngster scold himself for some infraction: "No, breaking toys is bad!" The child may even imitate his parent's tone. of voice! Authorities have determined that the process of internalization is usually complete by the time the child is between 4 and 5 years of age. Yet how many parents fail to train their very young children because they believe that children can't understand until they are much older? How many leave the teaching of their children to teachers when they start school? By the time a child starts school, his attitude toward authority, his level of ambition, his understanding of right and wrong and even the ability to learn are, to a great degree, already set! Yet some psychologists will tell you that it is perfectly natural for a young child to lie — for instance, to avoid punishment after breaking a lamp. These misguided authorities will tell you that you should not worry about dishonest behavior in 3 — or 4-year-olds. They are wrong. Children this age are building the foundation of their character for life, and it is the parents' duty to properly supervise that construction. Wiser observers offer better advice about guiding children: "Children want values," says Carol Gardner Silverman. "It is a disadvantage for kids to grow up without them. We can be aware of the fact that dishonesty exists and at the same time recognize that it IS unhealthy to encourage children to give in to it." Many authorities believe that the single most important factor in imparting moral values to children is the example of parents. What does the child see the parent do in public? In private? Does the parent exceed the speed limit when the signs clearly state the speed limit? Does the unoccupied parent avoid undesirable social engagements by saying he or she is "too busy"? Does the parent lie on his or her income-tax return? I know an excellent elementary-school teacher who to this day fondly remembers the example of her mother, who found a nickel on the sidewalk and tried to find out to whom it belonged. After an article I wrote on emotional maturity appeared in this magazine, I received a letter from a woman who told me: "I need to reread this article over many times, then maybe [ will begin to overcome my bad habits that I have developed over the past years, especially in regard to my husband and children. The trouble is that I see the children have picked up those same bad habits!" Indeed, the statement "Do as I say, not as I do" is ineffective in inculcating honesty and other values into children's morals. • Be honest with children yourself. They, just like you, would rather know the truth than to be kept in the dark. And they can sense when you are not telling the truth. Remember that you are their model; everything you do is teaching them. Keep communication lines open so they know they needn't lie to you. • Monitor your children's thoughts and attitudes. Attentive parents can "read" children's attitudes just by noticing the looks on their faces. This requires spending time with children, of course — something too few parents do. Be closely aware of your children's development, and constantly encourage them to go in the right direction. • Be consistent in teaching, example and discipline. You are influencing the way your children make moral judgments. • Praise your children when they tell the truth. Even when confessions result in punishment! Show the child you are happy when he or she tells the truth. A child wants your approval. He wants to please you and will develop the habit of telling the truth because you show satisfaction with your child's honest response. • Don't encourage "white lies." Certain psychologists and educators would have you teach your children to lie, for instance, when they think they can avoid hurting someone else's feelings. But untruthfulness is habit-forming, and one lie must always be supported with others. Intimacy and love between people is much harder to develop when one finds that the other has been untruthful, even in "small" areas. • Help each child develop an understanding of someone else's perspective in situations. You should, in other words, help your child develop empathy through instruction and discipline. Remind the child: "How would you like it if he or she did that to you?" Encouraging this perspective correlates very strongly with positive moral development. "Children are exposed to deception very early on. They see it all around them. Even if their parents genuinely stress honesty in all relationships, there are other ways in which youngsters come in contact with deceptions we not only tolerate but accept." Mr. Sager points to the example of television advertising, much of which is more often than not implicitly inaccurate. Children soon learn that eating a certain kind of cereal won't make them into professional sports stars — on the contrary, that eating certain sugar-loaded cereals will rot their teeth! Sager continues: "Even if parents attempt to keep all promises, a child soon learns that others don't.... Once a youngster becomes convinced of this, and especially when lying seems to gain temporary advantage and truthfulness does not, patterns of deception may be set up that become increasingly hard to break." Such patterns must eventually be broken — indeed, never started in the first place. • Teach that being honest does not mean revealing every thought. It is not always necessary to comment, but when one does, everything one says should be the truth. Diplomacy is not necessarily dishonesty. • More and more parents, teachers and social researchers are rediscovering the value of reading and telling moral stories in teaching children. There is, after all, something to be said for giving children right role models to look to. Such examples have a positive impact on impressionable young minds. • Teach children to control frustration and not to expect instant gratification of every desire. Such an expectation encourages manipulative lying. 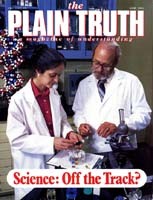 The magazine you are reading is called The Plain Truth. It is dedicated to giving you a clear, straightforward understanding of world affairs, happy family relationships, social issues and religious questions. It is dedicated, as its title implies, to fostering truth. Honesty and other positive traits of moral development are all part of character, an indispensable factor in successful living, whether on a personal, national or international level. Me? I was blessed to be taught honesty by a combination of all these factors — parental training, positive peer influence and good role models — plus one other. I haven't always been perfectly honest — none of us have — but then, I don't claim to have any excuse. I remember my parents telling the truth even to the point of blunt frankness, sometimes even to their own hurt. I remember, when my brother and I were small boys, riding through the cotton fields of southern Missouri with our parents. We boys had been born and reared in the city of St. Louis and had not seen cotton growing. The suggestion came up that it would be easy to stop the car, go out into the field, and pick some cotton to see what it looked and felt like. "No," I remember my mother saying. "That would be stealing. The cotton belongs to the farmer. It is enough that you look at it and feel it." My brother and I learned something more important than what cotton looks and feels like. When I showed an interest in reading, my parents pointed me to biographies of great people of the past. I remember being stirred by stories of men like Abraham Lincoln, George Washington and Winston Churchill. General Douglas MacArthur said he would return and did. Every people has its heroic figures who are symbols of honesty and truthfulness. Their biographies should be read. I remember going into grocery stores in small towns and seeing blank checks from banks available at the checkout stands. You could write a check on your account and the storekeeper would take your word that you had enough money in your account to cover the check — that you even had an account, for that matter. I remember wondering how the storekeepers could trust people like that. The answer, at least to me, was clear: because honest people didn't lie. I can remember several times in my life when my parents, friends, even people I hardly knew were frank with me about personal faults I had. It didn't feel good at the time, but I learned to be glad when they told me, because then I could correct the fault. Their honesty paid off and I appreciated it. My parents did one other important thing: They taught me the Ten Commandments, the ninth of which says: "You shall not bear false witness against your neighbor" (Ex. 20:16, Revised Authorized Version). I remember being made to copy the Ten Commandments from the Bible and hang them in our kitchen so we could all see them every day. I had the Ten Commandments memorized and knew that they worked before I grew up and read the writings of all the people who said they didn't — that they weren't in force anymore. The Worldwide Church of God publishes an attractive booklet explaining just what those The Ten Commandments are and how they can work to make your life happier and more prosperous, too. If you would like a copy, just write us at the address nearest you and ask for The Ten Commandments. Think what it would be like if everyone in the world told the truth all the time! Think of the problems that would be solved — the heartaches that would be prevented. Honesty will be the only policy when God's kingdom is set up on earth, and the coming of that kingdom is just ahead of us now. The Bible tells us that at that time, "Truth shall spring out of the earth" (Ps. 85:11). Outside that kingdom — in the lake of fire! — will be "whoever loves and practices a lie" (Rev. 22:15, 21:8, RAV). Why not practice the happiness — producing way of honesty in your own life — and teach it to your children — now?